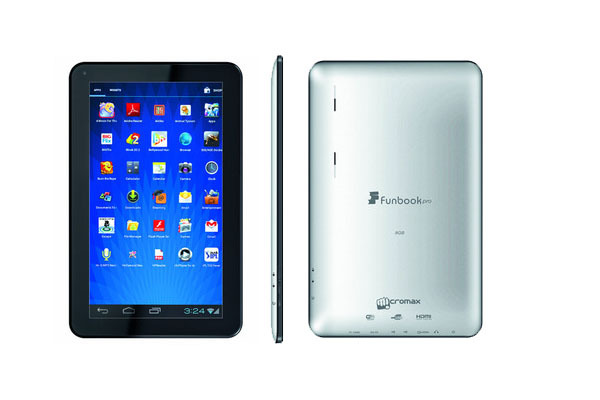 Online Retailer SnapDeal listed the Micromax Funbook Pro at Rs. 9999. Micromax Funbook Pro, the 10.1-inch tablet comes with 1.2 GHz Cortex A8 Processor, 1 GB DDR3 RAM, 8 GB Internal Storage and VGA Front Facing Camera. The Funbook runs on Android 4.0.3 Ice Cream Sandwich. The Funbook Pro comes with Wi-Fi Connectivity but you can enjoy 3G via 3G Dongle Support. It also features HD Video Playback, Expandable memory upto 32 GB, HDMI and 5600 mAH battery. The Tablet is available in Slate Grey color, 1 Year Warranty and you can get Tata Docomo Photon + Data Card for the fee of Rs. 500.